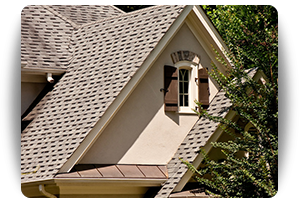 Different types of roofing are available to the home owners of Cleveland. The descriptions of pitched roofing, flat roofing, rubber roofing and built up roofing are discussed below. Pitched roofs are roofs set at a slope angle, usually more than 20 degrees, on top of the roof. This remains to be the common type of roofing in homes and can be done with a wide variety of materials such as asphalt, wood, clay, fiberglass, and metals. One of the advantages of a pitched roof, as opposed to a flat roof, is that water from snow and rain slides off of the top of the roof. Debris also has a tendency to slide into the gutter due to the slope of the roof. Pitched roofs have proven to be a consistently dominating choice when it comes to roofing for Cleveland homeowners. 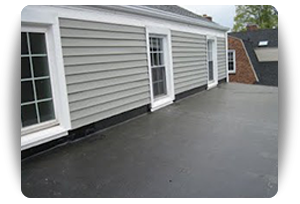 Flat roofing for Cleveland homes and properties is type of roofing option that turns the roof of any building into a potential deck where outdoor activities can take place. Many buildings across the United States have flat roofs, also known as flat decks, and increase the utility of a building by allowing the ceiling to become a usable area that still prevents water and ice damage and maintains insulation. Flat roofing for Cleveland homes has all of the same water and ice damage preventing properties that are found in other roofs. Flat roofs have a very slight inclination that allow for water to run off into gutter systems that prevent the water from penetrating the roof. Gutters on flat roofs often lead directly to the ground. Roof Gardens – Roof and terrace gardening are popular ways for those living in urban residences to still engage in gardening activities. The roof of any building can become a haven for potted plants and garden bed installation. These gardens receive sunlight throughout the course of a day, absorb precipitation, and are just one way in which flat roofing for Cleveland turns any property into a useful area. Solar Power – Solar power can be harvested and utilized in large amounts with flat roofing for Cleveland properties. The roof of any building can become a massive solar power absorption device by using the surface area of a flat roof and covering it with solar panels. Recreation – The potential for recreation with flat roofing for Cleveland residences is perfect when planning any outdoor activity. A grill or hot tub can turn any roof into a summer party and recreation spot capable of entertaining large groups. Rubber roofs are becoming increasingly popular as a material used to build pitched roofs. Since asphalt shingles, which are the most common type of shingle, only last an average of 15-20 years, rubber roofs have proven to be an economically viable option. Rubber roofing lasts much longer than asphalt, and rubber shingles are much cheaper, lighter, and more durable than slate shingles. As an additional perk, rubber shingles are made of recycled tires and other rubber sources, making them a much more environmentally friendly material to use as roofing for Cleveland homes. 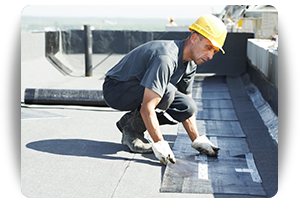 Built-up roofing (BUR) is a membrane made of gravel and other bitumen materials such as asphalt. It is a membrane that is laid over low slope or flat roofing for Cleveland homes. Built-up roofing for Cleveland roofs provides excellent waterproofing of your roof as well as ultraviolet protection. Built-up roofing is very low maintenance and highly durable through any weather conditions. Ballasted asphalt is a common material used in built-up roofing for Cleveland flat roofs because of its fire retardant qualities. Contact Us to learn more about the types of roofing available for Cleveland. Our team will be happy to answer any questions about how this roofing style might be the answer to your needs for space, efficiency, and quality recreation: (216) 281-5656.